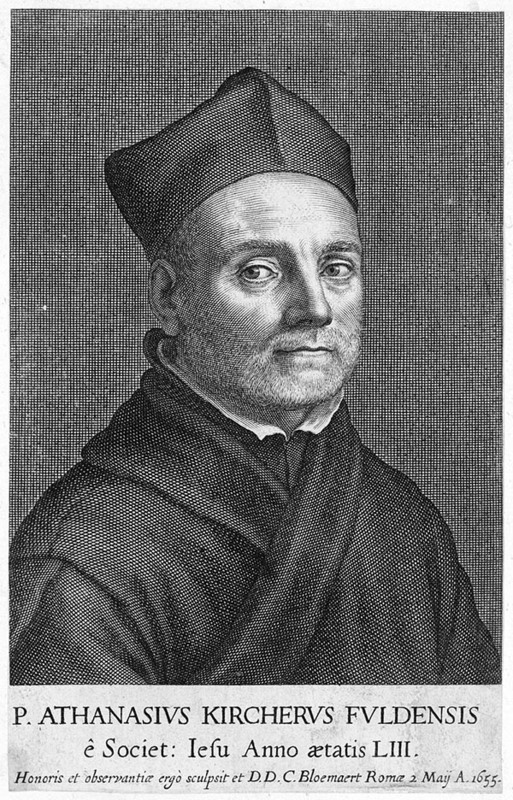 Athanasius Kircher (c. 1601 - 1680) was a 17th century German Jesuit scholar and one of the most respected and remarkable men of his time. A master of languages, mathematics, science, geography, physics and oriental studies, many consider Kircher to be 'the last true Renaissance man.' Kircher attained almost global fame in his lifetime for his numerous scholarly publications. Indeed, Kircher was the first documented scholar able to fully support himself on his own work, which, in his case, included some forty volumes on diverse fields. As a Catholic in Germany, Kircher was frequently at odds with the rising powers of Protestantism. Consequently, in 1628 he joined the priesthood and after extensive world travels eventually settled in Rome. There he was employed as a Professor of Mathematics and Oriental Languages at the Collegio Romano. Inspired by the eruption of Vesuvius in 1637 and the two weeks of earthquakes that shook Calabria in 1638, Kircher turned his considerable intellect to the natural world. Kircher's research into Geography and Oceanography culminated in the postulation that tides and currents were caused by water moving to and from a great subterranean ocean. Kircher published his geographic work in the important 1664 Mundus Subterranous, which in addition to several world and oceanic charts, included a fascinating map of Atlantis. Kircher is nonetheless, not unimpeachable. One anecdote tells how a rival scholar presented Kircher with a manufactured gibberish manuscript he claimed to be an recently discovered ancient Egyptian text in need of translation. Kircher produced the translation instantly. In addition to his significance as a scholar, Kircher is best known for his invention of the Magic Lantern, precursor to modern cinema. He also founded the Museum Kircherianum in Rome.